The spot, which started running in Georgia in the days leading up to Tuesday's Republican Senate primary runoff, tied Nunn, the Democratic nominee, to President Barack Obama and Obamacare and claimed she supports higher taxes. For Nunn, the commercial is a taste of things to come in this year's high stakes battle in the Peach State, one of one two Senate races in which Democrats hope to play offense as they try to keep control of the chamber in November's midterm elections. The nonprofit executive and daughter of former longtime Sen. Sam Nunn was mostly untouched by Republican attacks as the battle for the GOP Senate nomination in Georgia went into overtime. That ended Tuesday, when businessman David Perdue narrowly edged out Rep. Jack Kingston in the party's Senate runoff. Perdue, a former CEO of Dollar General and Reebok, and Kingston finished first and second in a seven-candidate field in the May primary, beating out a bunch of more conservative candidates. In the two-month long runoff, Perdue continued his strategy of running as an outsider, painting Kingston, an 11-term congressman who represents a district on the Georgia coast, as an insider. The campaign leading up to Tuesday's runoff became increasingly ugly, and personal, as the two candidates and their allies sharpened their attacks. Perdue and Nunn are running to succeed retiring GOP Sen. Saxby Chambliss. Minutes after Perdue's victory, the National Republican Senatorial Committee called Nunn "President Obama and Harry Reid's 'top recruit.' "
"Michelle Nunn who repeatedly refuses to take a stand on the issues including ObamaCare. David's momentum will force Nunn to stop hiding and start answering the tough questions that she's ducked up until now," Sen. Jerry Moran of Kansas, the NRSC chairman, wrote in a statement. Perdue's victory over Kingston robs Nunn of the opportunity to run against Washington and congressional Republicans. But Democrats will now focus on Perdue's business record, using many of the tactics they deployed against 2012 GOP presidential nominee Mitt Romney. Democrats fired away minutes after Perdue's victory. "When Mitt Romney got pummeled in the 2012 election, the GOP was forced to reboot and consider how to attract candidates who can be more competitive. In Georgia, the GOP's conclusion was to run an elitist millionaire with a checkered business record and an inability to understand the concerns of working families. Sound familiar?" said Brad Woodhouse, president of the pro-Democratic opposition research shop American Bridge. There was a similar message coming from the Democratic Senatorial Campaign Committee. Guy Cecil, the group's executive director, said in a statement that Perdue's resume included "tearing apart companies and communities by slashing thousands of jobs in Georgia and across the country," claiming that Perdue walked "away with millions for himself." Democrats also hope to use the ammunition handed to them by the long and nasty GOP nomination battle against Perdue. The DSCC went up with a web video that highlights some of the attacks against Perdue by his Republican rivals during the primary campaign. "Democrats do have a chance in Georgia. Nunn has been able to spend more than a year raising money and putting an organization together while Republicans have been battling for the nomination. Democrats also got the Republican nominee they wanted in Perdue. The DSCC is almost giddy at the prospect of running against Perdue's business record and believe they will turn him into the next Mitt Romney," said Jennifer Duffy, senior editor for the nonpartisan Cook Political Report, a top campaign handicapper. The battle in Georgia will now turn into a battle of big bucks. Nunn raked in nearly $3.5 million the past three months. Meanwhile, Perdue poured more than $3 million of his own money into his campaign during the primary. The race is also one with political pedigree. Nunn is trying to follow in the footsteps of her father, Sam Nunn, who's a household name in Georgia after representing the state in the Senate for nearly a quarter century. Perdue is a cousin of former two-term governor Sonny Perdue. Democrats see Georgia and Kentucky, where Senate Minority Leader Mitch McConnell faces a challenging re-election, as the only two states in which they hope to flip Republican-held seats. Georgia has been a GOP stronghold recently: It's been 14 years since a Democrat won a statewide gubernatorial or U.S. Senate election, and 22 years since the party carried the state in a presidential contest. But Democrats think Georgia's changing demographics are putting the state in play. Nonpartisan polling suggests a close contest right now. "I think Georgia is going to be a very competitive race between two very well-funded candidates," said Nathan Gonzales, deputy editor for the non-partisan Rothenberg Political Report, another top campaign handicapper. "This race won't be won or lost because of money. Republicans have a structural advantage in the state but we have to see how Perdue and Nunn perform as the heat gets turned up and the lights get brighter in the race,"
With the GOP primary finally over, the general election race will now get hotter. The big question is whether Nunn is ready for the soaring temperatures. "Nunn has gotten a free ride and remains somewhat untested when it comes to taking hits and answering charges," Duffy said. "Perdue is now somewhat battle-tested from the primary, but we have to see how Nunn performs when the heavy attacks come her way- and they are coming," Gonzales added. seriously georgia, why vote against your best interests and vote for a democrat? this nunn person is running on her daddy's name and that is it. why send another obama supporter to congress? so they can jam even more down our throats in the last two years of the obama nightmare? 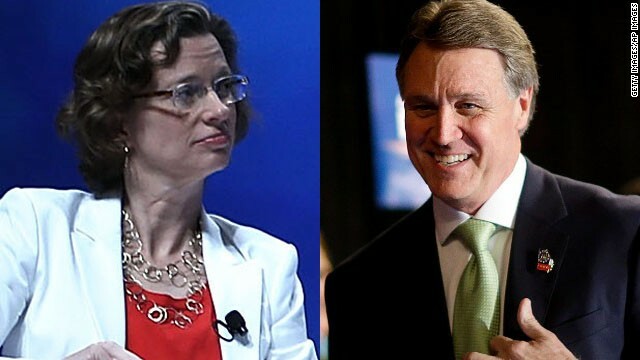 Michelle Nunn is just the person we need in Washington for Georgia. All Women need to show the men how things should be done. Yeah, I guess the Thousand Points of Light Organization is too leftist for the GOP. Nunn looks like a nun. Would she even be running If her last name was McDurkel? Nope. Get out and vote. If you do nothing else this year, or in 2016, VOTE. I'm not from Georgia but I'm going to contribute to Michelle's campaign. Time for a change in the south, not only in Georgia but also here in Texas. @Anonymous – Nunn looks like a nun. A perfect example of the tolerance, equal opportunity and stereotyping the right throws out, all based on feeling and emotions and not one iota of FACT or truth included! People outside the state have no idea what the name Nunn means to many Georgians. In Georgia it stands for trust. They always trusted Sam Nunn. If they think they can trust the daughter like they could him, she just could win.